such as and that provide fuel and shelter. There were animals on the farm by 1721. G: Good morning, everybody. Thanks for joining us today. 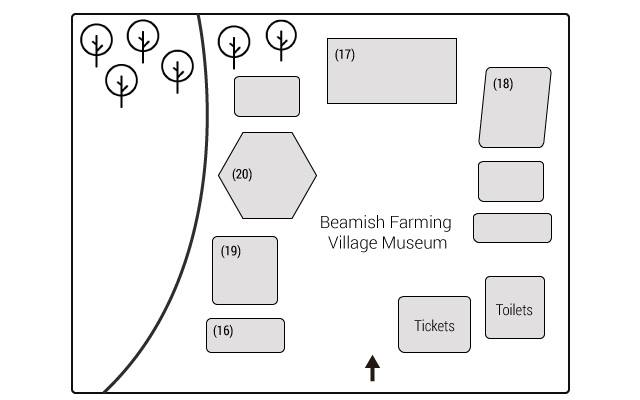 Welcome to Beamish Farming Village Museum. First of all, I’ll give you a quick overview of the history of the museum before you go off and have a look around on your own. So, if you look over here to your left, you can see the river that runs right through the middle of the village. It was because of this natural source of freshwater that this site was an obvious location for a farm. The woods just beyond the river are another reason as they provided both fuel and shelter. In these ways, the site was very suitable for the purposes of agriculture from an early time and in fact there is historical evidence that a farm in some form or another has been located here since the early 16th Century and the landowner at that time was a Mr John Snow. Local archives contain data on land use from this time and it is noted that livestock was kept in the fields over here between the river and the woods. Over 200 animals including pigs and chickens were kept here at the time the data was recorded in 1721. G: Now I'm going to give you a plan of the site and I just like to point out where everything is and then you can just wander around for yourselves for the rest of the visit. I've already pointed out the river, which is on the left, and you should be able to see that on your plan – it’s the curved line. Now we're standing at the entrance where the arrow is at the bottom of the plan, and immediately to our right is the ticket office. You won’t need to go there because you've got yours but just past it are the toilets. Always useful to know where they are. To the left of us by the entry gate is the gift shop. That’s where you can buy guidebooks and souvenirs. Now, if you look straight ahead, you’ll see that all the buildings are arranged in a semicircle. The big rectangular building right opposite us at the far end of the site is the workshop. That's where the farm machinery was repaired. The building to the right of the workshop is the store. It’s the big building slightly at an angle. Now, if you look again at the gift shop on our left, the building next to that, the long building, is the engine room, and the one after that, the building with six sides, is the café. Obviously that’s a new building but you’ll be pleased to know though they do serve very nice old-fashioned teas and scones. So, I think that’s everything. As I said, you’re free to wander around yourselves but if anyone would like to join me for a guided tour, I’ll be starting from the engine room in ten minutes.